Consumers who are dissatisfied with travel services or don’t receive promised services have remedies they can pursue under common law and statute law. 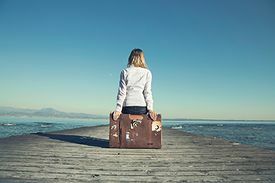 Client has paid a deposit to a travel agent, but the agent has gone out of business and the client has not had or cannot get some or all of the holiday that they contracted for. Client got a small claims judgment against a travel agent because the trip the agent supplied was not as advertised, but the agent has gone out of business and the client cannot collect on the judgment. Client wants to take an action against a travel agent because the trip the agent supplied was not as advertised. Client says a hotel or other travel service was not of the standard promised or advertised. In most transactions, a consumer deals directly with a business supplying a product or service: a car is bought from a car dealer, credit is obtained from a credit union, a repair service is obtained directly from a repairer. With travel, consumers often use an intermediary, a travel agent, to obtain services for them. A travel agent provides an efficient and easy way for consumers to buy flights, hotels, vacation packages and other travel services around the world. Because travel agents are a main part of the travel industry, and because of the problems consumers may have in obtaining direct satisfaction from a supplier for breach of services provided through a travel agent, it is not surprising that considerable litigation and legislation focuses on the responsibility of travel agents for consumer travel contracts. When consumers do not use an agent and instead deal directly with businesses supplying travel services, such as a hotel, the usual rules of contract law (see the sections on Contracts, Defences, and Remedies) and the provisions of the Business Practices and Consumer Protection Act apply. The provisions of the Act governing distance contracts apply to internet purchases of airline tickets, holiday packages, and so on. A “distance contract” is basically a contract that is not negotiated in person. The relationship between consumers and travel agents is essentially one of contract. However, some special aspects of this relationship are governed by principles of a subcategory of contract law known as the “law of agency”. In addition, there have been some court cases that have said that the law of negligence applies to the consumer-agent relationship. In general, the duty of a travel agent is to exercise reasonable skill and diligence in performing the terms of the agency contract with the consumer. If there is a written contract between the consumer and the agent, the agent may seek to limit its liability under this duty as a term of the written contract. In some instances, therefore, the courts must consider not only whether the agency contract was breached but also whether the particular breach is one for which the agent is responsible. In Bratty v. Lloyds World Travel Service, the BC Court of Appeal upheld a damages award of $3,000 against a travel agent. Among other faults, the agent misadvised the consumer of certain visa requirements, causing the consumer considerable inconvenience. The court held that the actions of the agent were a breach of contract. The court also held that the agent could not rely on the limitations of liability printed on the invoice for services, because the limitations had not been specifically drawn to the consumer’s attention prior to travel. In many cases against travel agents, the issue is what losses can actually be claimed. In general, if an agent is found liable, the agent is responsible for reasonable expenses (for example, alternative airfare, additional hotel costs) incurred by the consumer in remedying the breach, as well as for refunding the consumer the costs of any unused portion of a trip. In addition, the courts have said that consumers may also be entitled to general damages for the inconvenience arising from the fault of the agent. In Keks v. Esquire Pleasure Tours Limited, for example, the plaintiffs were awarded $800 for inconvenience. Statutory remedies for consumers are contained in the Business Practices and Consumer Protection Act and the Travel Industry Regulation under that Act. Travel agents and travel wholesalers (both called travel agents in this section) must be licensed under the Business Practices and Consumer Protection Act. Consumer Protection BC supervises the licensing and operation of travel agents. Consumer Protection BC has the power to refuse to issue or renew a licence, to suspend or cancel a licence, or to impose conditions on the licence of a travel agent. The Travel Industry Regulation, in section 14, provides that at the time the licence is issued, the agent must post security for claims against the agent by consumers. Consumer Protection BC also has certain investigative powers, as well as powers to protect consumers by ordering assets to be frozen. Further, Consumer Protection BC can apply to court for a receiver to take over the operation of a travel agency. Agents are required to pay into a Travel Assurance Fund from which consumers may be able to get compensation for losses arising from problems with travel agents. Under section 18(1) of the Travel Industry Regulation, consumers can make claims to the fund when they have suffered a loss by reason of paying a travel agent for travel services that were not provided. Consumers have six months from the date of their loss to make a claim against the fund (see section 19). The maximum compensation available from the fund is $5,000 per person who was affected by the loss (see section 22). Gather and confirm all information on the circumstances of the vacation and the client’s complaint about it. The Travel Assurance Fund exists to address the first situation. Help the client to prepare and submit a claim to the fund. Carefully review the Business Practices and Consumer Protection Act and the Travel Industry Regulation to confirm that a claim is appropriate, including how much the client might be able to claim. Staff at Consumer Protection BC may be able to give some guidance on this. Note that some situations may be urgent and should, initially, be reported to Consumer Protection BC. The Travel Industry Regulation allows payments from the Travel Assurance Fund in certain emergency situations (section 21). If a travel agency has just closed, you should immediately ensure that Consumer Protection BC is aware of the closure. Consumer Protection BC may be able to preserve funds due to the consumer, which might otherwise be lost as a source of compensation if quick action is not taken. In other situations, the consumer will probably have to consider making their own claim against the travel agent through negotiation or court action. In that case, carefully review the travel contract between the consumer and the agent to consider the liability limitations the agent has set. Such limitations may make claims against the agent more difficult, though not necessarily impossible, particularly where there have been misrepresentations for which the Business Practices and Consumer Protection Act may give a remedy. See also the Canadian Consumer Handbook from the federal government’s Office of Consumer Affairs, the chapter on “Consumer Protection” from the UBC Law Students’ Legal Advice Program, and People’s Law School’s pages on holidays. This page was last edited on 11 October 2018, at 06:19.